Arthroscopic knee surgery is big business in the United States. Arthroscopic partial meniscectomies alone cost $4 billion/year. Yes, billion. But do they work? I’ve written previously about arthroscopic surgery for a torn meniscus and how it adds nothing above and beyond physical therapy for people with arthritis. We also know that arthroscopic knee surgery for arthritis isn’t effective either. Given the poor performance of these arthroscopic surgeries for knee pain looking at other arthroscopic procedures, such as partial meniscectomies for a symptomatic degenerative tear, is crucial. Interestingly, as the authors of a new study looking at partial meniscectomy for degenerative meniscal tears point out, arthroscopic knee surgeries for arthritis have decreased since the studies showing their lack of efficacy were published, however, there has been a 50% increase in surgeries for meniscal tears. I suppose that could be attributed to the overuse of MRIs for knee pain (when did the clinical exam become obsolete?) 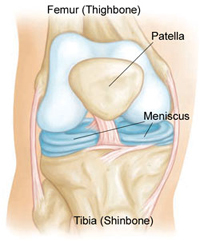 and the fact that meniscal tears are very common (35% of people over the age of 50 will have a meniscus tear on MRI). However, the cynic in me wonders how many times another “diagnosis” was identified so some kind of surgery could be offered, either because the surgeon couldn’t think of something else to offer, the surgeon wanted to fill their time on that day, or the patient pressed so much for and operation that the surgeon gave in. This new study is a wonderful prospective randomized double-blinded trial with an elegant sham procedure with the data fully evaluated and analyzed before the investigators were unblinded. Also, the surgeons did not participate in the post operative care so there was no way patients could be accidentally informed about their procedure, true meniscal surgery or simply a diagnostic arthroscopy. The results? Arthroscopic surgery offers nothing for patients with a partial degenerative meniscal tear who do not have arthritis. Patients with traumatic tears were excluded from the study, so the outcome is only applicable to degenerative tears. Why does this matter? Considering the prevalence of chronic knee pain and the sensitivity of of MRI at identifying meniscal tears, it matters a lot. And the $4 billion we are spending on direct medical costs for this unnecessary surgery. Surely that money could be used elsewhere? There are also the indirect costs of missed work and disability payments, raised health care premiums to pay for the unnecessary surgery, and of course the risk of surgical complications. (Don’t even get me started on how much we could save by preventing unnecessary hysterectomies). As a chronic pain medicine physician I appreciate the desire to get better as quickly as possible, but for most painful conditions the path to wellness doesn’t involve a scalpel and a surgery that will not produce the desired outcome is a worse option than no surgery. To invest the time, effort, risk, and great expense of surgery there must be proof that it offers a chance to help. Given the solid lack of evidence for pain attributed to a degenerative meniscal tear, Medicaid, Medicare, and insurance companies should stop reimbursing for partial meniscectomy. We accept so little of surgery from an efficacy and safety standpoint compared with medications. At least you can stop a medication, but you can’t undo a surgery. What if every procedure were required to have the same type of efficacy and safety data for approval as the FDA requires of medications? « The US is still a leader in infant mortality, so where are the pro-life politicians? I somehow twisted my left knee last April; it became very swollen and painful. I saw my old colleague, the orthopod, who examined it and thought I’d torn the medial meniscus. I had an MRI, and at review a tear was confirmed on the scan. My friend said that I’d not be any off with a laparoscopic procedure. It’s still uncomfy at times, and feels a bit peculiar. But I was glad to avoid surgery. This, of course, was in the UK. I enjoyed reading this article. It was particularly revealing in many ways. Since I find myself dealing with this situation, It is reassuring to know that prior to taking a big step into surgery we should consider PT as a first option before diving into an unnecessary or at least preventable surgery. Surgery, less invasive than ever before is no less responsible for the misuse of funds that could otherwise go to educating patients about more preventive ways of taking care of our bodies. I recently had an Arthroscopic Partial Medial Menisectomy (Code 29881) due to a torn meniscus. Cost was $15,900, ($2,285 Dr. Charge included). The rest of the bill was for the “facility” in which the outpatient surgery was performed. The insurance, Blue Cross Blue Shield did not ever require an authorization to do the surgery….Unbelievable! They require an authorization for an MRI at $1,700 plus. I pay a 25% co-pay or $800 out of pocket. I was told I would get “local” anesthesia, but instead received either deep sedation or general anesthesia; I was out cold. Still trying to obtain a detailed list of the facility costs. Avg costs should be $7,400-$9,000. Done at Merritt Island Surgery where Drs. from Space Coast Orthopedic Center do their surgeries. The insurance company only accepted charge of $2,800. It’s only been 9 days since I had it done. The physical therapy people are trying to tell me it could be 4-6 MONTHS before I’m fully recovered. Should be 4-6 weeks.